Find us sharing best practice and the latest industry research. Learn how to improve talent and performance management, business communication skills and e-learning in your organization. Don’t miss out on these unique resources! 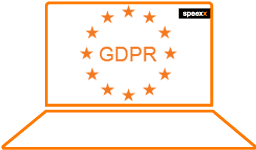 Based on the results of the annual Speexx Exchange Survey, research conducted with over 700 HR and L&D professionals from across the world, as well as during the live polling sessions of Speexx Exchange Berlin. Personalized learning is becoming the backbone of modern businesses. Download this whitepaper and learn how AI and technology-driven L&D adds value as a strategic tool for greater business agility and talent retention. HR and L&D professionals play a key role in building a stable and engaged workforce equipped to respond to shifting business priorities. Download this whitepaper and learn how to better align HR and L&D with your business objectives. In a technology-driven workforce, establishing human-shaped priorities is key for HR and L&D professionals. Technology’s effect on the global workforce is causing a reskilling revolution, and businesses need to rethink how humans and AI work together in today’s Digital Transformation. In this webinar hosted together with Docebo, we discuss how Digital Transformation enables a user-centric approach to L&D, what is the potential it brings to learning and how to implement these concepts in your strategy. This Infographic contains the “holy grail” of learning outcomes: a set of benefits and objectives reflecting a top performing learning culture. Only 1 in 5 organizations are achieving this. Download the infographic and learn more about the current state of L&D in companies across the world, as well as the factors that contribute to a successful L&D strategy. The demand for corporate responsibility is rising worldwide. Learn how to transform your business into a social enterprise and satisfy the needs of today’s demanding workforce. Discover how adopting a user centric approach and focusing on employee experience can help drive engagement and success in L&D programs. Digital transformation has radically changed the way training is perceived by employees. L&D professionals need to adapt their strategies and implement the new, emerging trends such as user-centric learning. 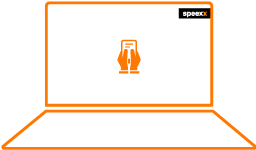 According to the Speexx Exchange survey, HR and L&D professionals have a clear idea of how to define the measurable benefits of training programs. Download this infographic and learn how to define a KPIs & ROI framework that works for your organization. Get expert advice on developing an effective digital learning strategy, transforming corporate communication and measuring the results of soft skills development in the workforce. 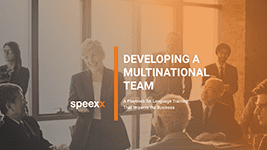 This free e-book for language training addresses organizations looking to develop exceedingly successful communications within their multinational workforce. Learning professionals are aware of the importance of offering inspiring learning. However, while many companies have undergone a digital transformation, when it comes to using microlearning, gamification and enhanced continuous learning, many L&D departments can still do better. 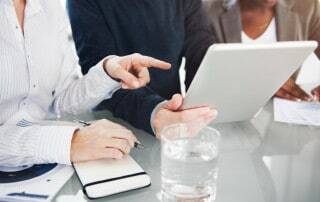 The key to addressing HR and L&D challenges successfully lies with maximizing learning technology to drive a self-directed learning culture, with a focus on soft skills. Find key insights on how to drive learning success. Microlearning offers a valuable solution to impact learning retention and learner motivation. In this masterclass webinar you will learn how to make your L&D efforts drive organizational culture and employee engagement. How do the General Data Protection Regulations impact HR and L&D departments? What do you need to know and how can you make sure your organization is fully compliant? 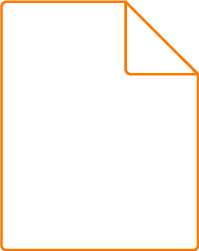 View the recording of this webinar and get a clear understanding of how the changes brought by GDPR will impact your work! As data protection regulations are being standardized across the European Union, companies looking to implement digital learning solutions and cloud-based employee performance analytics on a global level are likely to hit the issue of data protection head-on. This paper offers HR and L&D professionals some guidelines for dealing with this challenge effectively. Download this white paper and learn effective ways to construct training measurement and evaluate the impact of your L&D program. Providing employees with professional development opportunities builds an effective workforce and a motivated corporate culture. But what are the best ways to determine the balance between costs and benefits? Download this infographic and find out the what the results of the Towards Maturity benchmark. How large is the gap between vision and reality and what skills do L&D professionals need to urgently improve? In this webinar, you will learn which crucial changes in the HR landscape highlighted by global thought leaders you should pay attention to, practical insights through real business cases that reflect the top global human capital trends and best practices from global HR and L&D peers. In this webinar, you will learn which crucial changes in the HR landscape highlighted by global thought leaders you should pay attention to, practical insights through real business cases that reflect the top global human capital trends and best practices from global HR and L&D peers. Download the recording of this webinar for a comprehensive recap of current relevant trend reports and benchmarks. This white paper will help you find the key to successful recruiting in the era of Digital Transformation. You will get an in-depth look at the characteristics of the modern workplace, insights into what matters most to today’s employees, as well as a series of practical tips on how to build a strong company and branding culture. What learning technologies do top companies use to get their employees engaged with their L&D programs? Download the infographic and see if your organization is up to date when it comes to the best technologies for learning in 2017. The source of this infographic is the “Towards Maturity Benchmark Report Unlocking Potential”. The results of the annual Speexx Exchange Survey show that even in mature multinationals, there is still a considerable gap between L&D and corporate goals. Download this white paper and learn how to correctly manage your HR and L&D strategy in order to maximize the value of your cloud-based learning solutions and underpin your organization’s strategic objectives. After attending some of the most important talent management events across Europe, Speexx has put together an exclusive infographic about digital transformation and the key HR and L&D goals for 2017. Download the infographic now and learn more about what our network of experts has to say, and the goals that will help you build a strong and efficient talent management strategy in 2017. What is still hampering the implementation of mobile and blended learning? 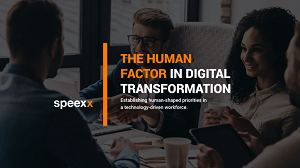 Download this infographic to get an overview of the results of the Speexx Exchange survey conducted among top HR and L&D leaders. Get a deeper understanding of the challenges that HR and L&D professionals face, as well as how the HR and L&D landscape has evolved in the past few years. Based on a survey of 230 global organizations, representing over 1.6 million employee, this report examines the shift towards cloud-based learning environments and addresses the need for a global communications strategy. A strong employer brand helps you attract and retain talent in your organization. How can you engage your employees with your employer branding strategy and what steps should you take to optimize recruiting and training? Speexx presents the five vital steps you need to take in order to build an effective employer branding strategy. 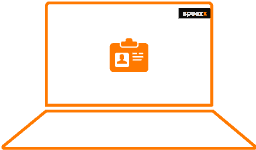 Download the infographic and start building your own employer brand. The need for better employee engagement and productivity has become pressing in an international marketplace. Forward-thinking organizations are responding to this by structuring themselves in a more responsive and flexible way. Which are the causes for the greatest misunderstandings in cross-border communication for your organization? Download this white paper and learn more about the appeal of virtual teams and practical tips for supporting successful virtual teams. As we analyze the results of the Speexx Exchange survey, we see that organizations are maturing rapidly. HR and L&D professionals play a key role when it comes to driving their organization towards a mature learning environment that facilitates flexibility. The white paper contains five practical recommendations that will help you create a sustainable learning culture in your organization. The world of work is being revolutionized more rapidly than ever. Globalisation, a 24×7 work environment and pervasive technology, coupled with demand for greater transparency, are transforming the modern workplace. If businesses are to grow and innovate, they need to manage these changes effectively. Blended learning – the combination of teacher-led and technology-based instruction – has gained tremendous momentum in corporate training in recent years. This paper explores how to get the perfect blend for your organization, how blended learning drives ROI and user benefits and what you need to do to kick-start your blended project. Diversity and inclusion crucial for success in today’s globalized business world. How can organizations truly embrace a culture of inclusion and boost cross-border communication? In 2014, workforces are increasingly multinational. Enterprises powered by globally accessible systems, now work across borders and time zones and the need to empower employees with specialised communication skills becomes more crucial than ever before. Effective communication skills are key to finding, managing and retaining talent across any multinational organisation. To develop a cohesive workforce and create a global talent pool of future leaders, HR needs to come up with a solid communications strategy. High-level workforce communication skills have a direct impact on the bottom line as employees across the world communicate effectively with each other, suppliers and with customers. In part 2 of a two-part whitepaper, we further evaluate some of the key goals for HR and L&D, focusing on communication skills, mobile and blended learning. Big Data, i.e. using learner data to hone personalized, effective learning, will play a key part in meeting these objectives. 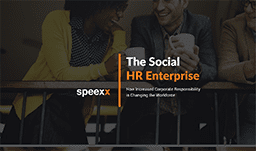 In Part One of a two-part white paper, we set out some of the key goals for HR and L&D leaders in, as revealed by the Speexx Exchange Survey and make practical recommendations on how to achieve these goals using Big Data. Empowering Communication – What’s in it for the bottom line? This white paper highlights the trends shaping the implementation of learning technologies in the workplace and the impact they are likely to have on business efficiency, profitability and growth. For many companies looking to expand their operations and revenue streams, multilingual communication is an asset across all activities, not just for sales and marketing. We host a range of webinars for different industries and professions, featuring partners and expert Speexx trainers. Check our upcoming sessions below and save your seat!